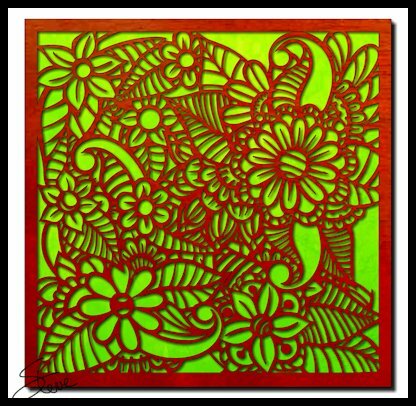 15" X 15" Tropical Flower Wall Art Scroll Saw Pattern. The original design came from www.freepik.com. I cleaned it up and added a border. The pattern is broken up over four pages and will have to be reassembled before you apply it to the board. I highly suggest Baltic Birch plywood for this project but if you can manage a glued up hardwood board this big it would look beautiful. I am considering making this the top of a small table. Recess this in the top with glass over the fretwork. I think it would be a show stopper to say the least. There are two ways to go about cutting this pattern. Both ways have pros and cons. Because it's so large a spiral blade would make handling the board much easier. The problem there is that you will not get the same smooth curves that you would with a straight blade. Using straight blades will give a more finished look to the pattern but will be a bit of a nightmare to handle the board. It will be especially difficult to cut the corners because the the large amount of board that will over hang the front of the table. If anyone takes on this challenging pattern I would love to see a picture. I'm sure everyone else would also. Someone very skilled with spiral blades needs to give this a try. Bear Woods your online source for Pegas Scroll saw Blades. For small orders make sure you check the small order shipping rate. 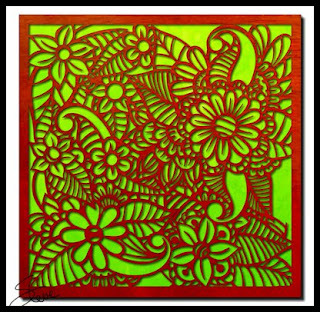 selection of scroll saw ready boards and more. 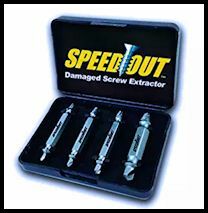 Removes any stripped screw in 10 seconds or less! Easy to use, just two easy steps!